Schooling is not the same as learning, and it is learning that truly unlocks the promise of education. This is what we know – education is the surest way to lift individuals, communities, and whole nations out of poverty. Years of economic and social research, and observational study conducted all over the world, confirms it. South African corporate social investors funded a variety of education-related programmes to the tune of over R4,3 billion in 2017 alone. Our government allocated over 20% of the national budget to education that same year. Belief in the power of education lies at the heart of Afri-CAN too, as we work to increase vulnerable children’s access to clean, safe early childhood development (ECD) centres. We know that education creates human capital, which has far-reaching and intertwined positive impact. By increasing pride and personal dignity, as well as academic learning, education influences earning potential, contribution to society, the ability to support family. A country with an educated workforce is one that enjoys sustainable economic development, shared prosperity, and a more stable political environment. However, schooling is not the same as learning, and it is learning that truly unlocks the promise of education. This is the message delivered by the 2018 World Development Report which documents that in many countries and communities learning is compromised, not schooling. Unfortunately, South Africa offers an example – consider that the often-celebrated matric pass rate obscures the high number of children who drop out of the schooling system before ever reaching matric. Schooling is not the problem – learning is. By investing in early childhood development centres so that vulnerable children are school-ready – primed to thrive in a formal education environment – we’re contributing to the first of those factors. When we first encountered each of the 52 ECD centres currently in our network, they were dirty and miserable places. They were not spaces in which children should spend any time at all, and while some attempts at schooling were taking place, these centres could not claim to promote learning. Some were downright unsafe. Many lacked even the most basic facilities like hygienic food preparation areas and toilets, let alone education equipment. Most of the children attending these centres come from homes where three nutritious meals a day is a dream, not an expectation. Many of the teachers providing care lacked confidence, skills and resources. Each of these educare centres was established with the best of intentions and fulfils a vital role in their communities. However, they were failing to graduate their children school-ready with an adequate foundation for lifelong learning. Mindful of the complexities inherent in creating the right environment for learning, we support our ECD centres in a variety of ways from providing fortified breakfasts and installing proper sanitation, to supporting teacher development. 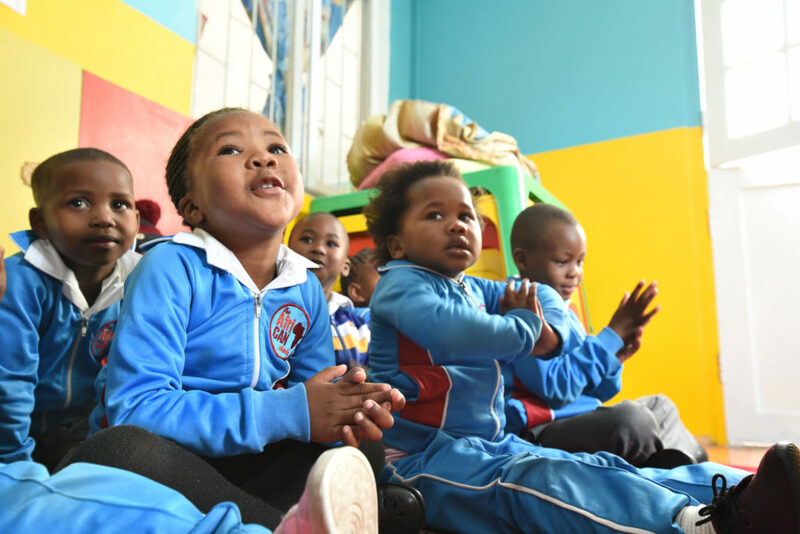 We fund interventions in six inter-related pillars to holistically prepare our children for learning because we believe that this is the route to unlocking South Africa’s potential, through education. This entry was posted in Early Childhood Development Nurseries, Uncategorized. Bookmark the permalink.